We'll be livestreaming Tarot readings using the new Light Grey Tarot deck! We've chosen three volunteers that are willing to have their readings done live and we're excited to give you a sneak peek of the deck in action and a preview of the amazing art that will grace our walls for the Tarot, Mystics and the Occult Exhibition! This Saturday the 6th (TOMORROW!) at 2pm Central Standard time, we'll be livestreaming our first reading with Kayla! The event will be live, so make sure to tune in at 2pm sharp to witness the unveiling of the deck! on Saturday October 20 at 2pm Central Standard Time to see Bree's reading! Lindsay Nohl, Light Grey's founder and the curator of the Tarot, Mystics and the Occult Exhibition will be reading the cards for our volunteers and will also be teaching a course on how to read with the Light Grey Tarot the day after our October 26th reception. 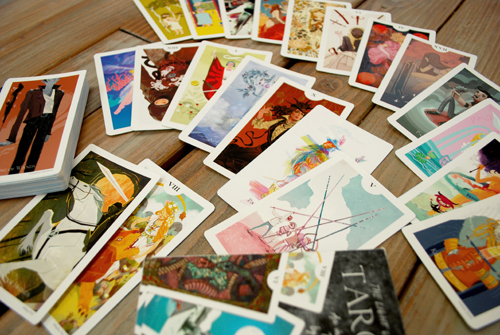 Reading with the Light Grey Tarot is a donation based mini workshop held from 1 - 2:30pm on Saturday Oct. 27th. If you have a deck, bring it on over and join us for an explanation and tips on reading insightfully with the cards! We'll be posting the readings here on the blog if you miss the livestream. Here is the link to tune in! We hope you can make it!